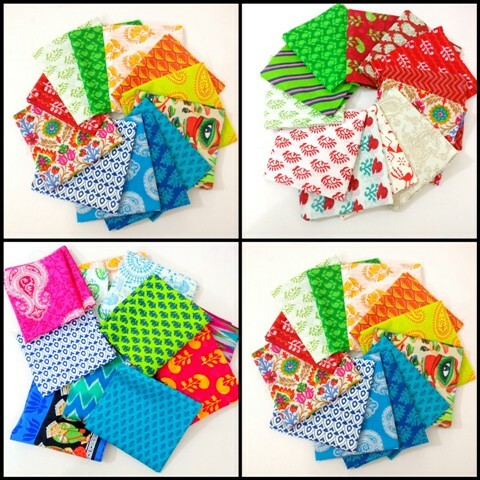 New Fabric bundles are up! It's festive season now in India. The boys just finished their half yearly exam and Durga Puja holiday just started. Now I can go back to settle my messy sewing room. It's overflowing with fabrics from the process of making fabric bundles. I used to be obsessed with finishing everything in a certain frame of time. But, recently I just take it as it comes. If I only have time to cut one fabric or to sew one pocket so be it. As long as I enjoyed it. Afterall I am my own boss, right? 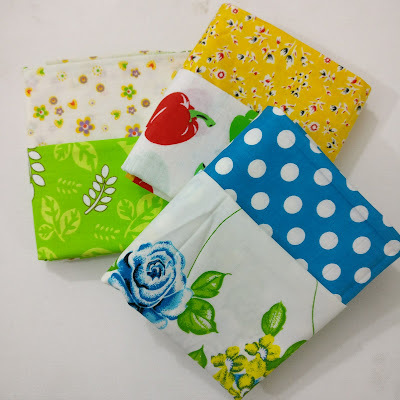 Today few bundles are uploaded in Chezvies Fabrics Club on Facebook. The group member can have early access to the bundles. Each bundle is different. They may be in similar colors but different prints. It's totally one of a kind bundles. Indian fabrics have so many color hues. Greens, pinks, yellows, oranges, reds and all of them are just too beautiful. If you love Kantha quilt and want to make one yourself, the pretty bundles will be a great start. Now that reminds me of my unfinished baby quilt. I have done the top but have not got the time to make the sandwich. Right now, few are already posted in the group. More will be added from time to time as time permits. Selecting fabrics, cutting them into fat quarters, folding, taking photos and editing and finally put them up in the shops are taking so much time. Since I do everything alone. But I really enjoy the whole process. Now all photos are edited and I will put them up in the shops whatever is left from the CLUB. If you're into Linen, I also got gorgeous block printed linens. It's simply beautiful. Check it out below this post. I've been very busy with fabrics in the past few weeks. I tried to destash some of my stocks by making them into fabric bundles and fabric duos. And in the process, loads of inspiration going through my mind and one of them was these kawaii (cute) bifold wallets. I used the pattern from Napkitten Pattern in Etsy. The pattern is a bit confusing at first since it does not have a template. I decided to make templates based on the measurement given. While making these wallets, I realized how much I enjoyed making small things from fabric remnants. Sometimes, we tend to be carried away by the current trend, that we lost our own focus. I realized I love making small things or something bigger with more details. I find it more challenging and it gives me immense satisfaction when I can complete it. I like to try a new technique or new materials since in India we don't have fancy bag making materials. I like to experiment and to see how's the result. The bifold wallet, even though it's quite small, it has bill compartment, slots for few cards, slip pockets and coin pouch. I am currently using one. It fits nicely into my fave sling bag. I'm still in scrap buster mode. Now, let's make Reversible Trivets or coaster. It's really easy - mind numbing project. This is the kind of project that lifts up your spirit or gets your sewing mojo back. - Fabrics scraps of various sizes and colors. - Batting scraps - I am using flannel in this tutorial. First, you need to decide the size. I normally go with the whatever size of the batting scraps. In this project, the batting is roughly 6.5" x 7". Now grab 2 small pieces of fabrics and put them RIGHT SIDE TOGETHER in the middle of your batting piece. Sew with 1/4" seam allowance. You can go with 1/2" or 3/8 seam allowance. It doesn't really matter. Now flip them open and finger press. I trimmed the pink stripe fabric a little bit. For a small project, the narrower the fabric strip the better. At least for me. Now take another strip of fabric and put them Right Side Together along with the longer side of the previous unit. Sew down with 1/4" seam allowance. Flip it open and finger press. Repeat the process until the batting area is covered. Once done, start quilting the panel. I love doing line quilting. You can quilt it in whatever design you like. Don't worry even if it's not straight. 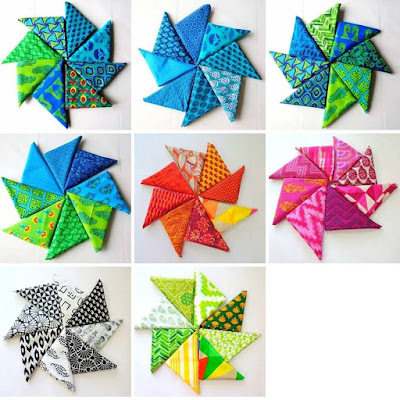 It's "your quilt, your rule" kind of project. Once it's done, trim the panel to the desired size. In this tutorial, I trimmed the panel into 5.5" x 5.5" roughly. It doesn't have to be square. Repeat the whole process with the other piece of batting and now you have 2 bright and beautiful quilted fabrics ready to make into something F U N.
If you want to make a pot holder, you can add another piece of batting in between the two quilted panels. for trivet or coaster, it's not necessary. Put the quilted panels right side together, and sew all around, leaving 2" gap for turning. Trim the edges by cutting the corners diagonally. Be careful not to cut into the stitches. Now turn the coaster inside out. Close the gap by hand sewing the opening or apply fabric glue. Voile, your one of a kind coaster is done and you can admire it. Actually, whenever I made something from those small scraps I feel like I saved the world. LOL. I wish I could sew clothes like Zero Waste Daniel . Here is another one I did. This one was hand quilted and hand sewn the binding. You can make many things with those tiny scraps. Like Patchwork Pouch, Mug rug, Table Topper or scrappy table mat. Now go and make few from your scraps. Tag me on Facebook or Instagram if you made something from this tutorial. 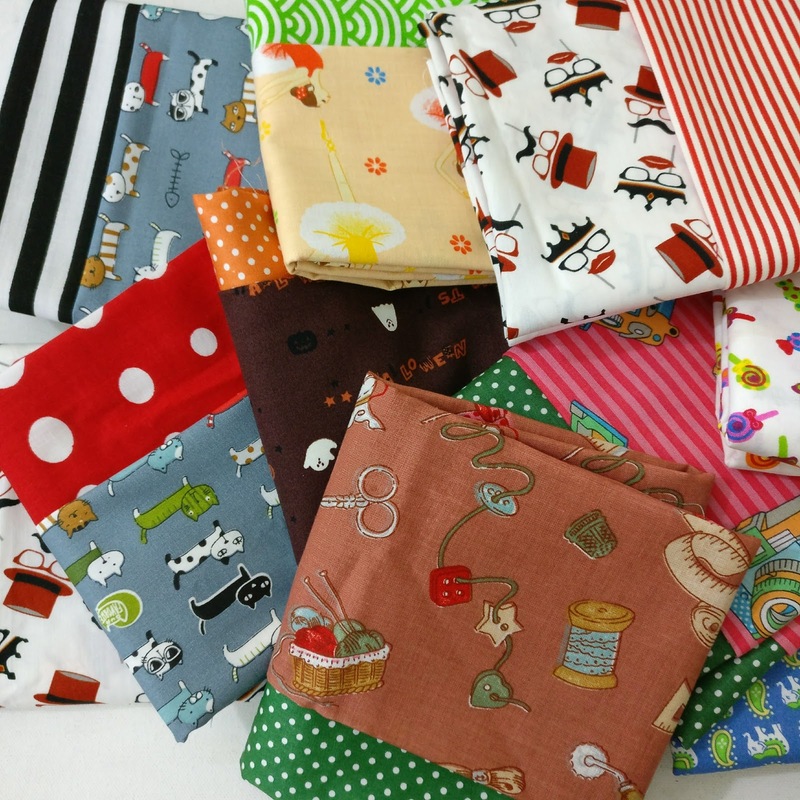 And if you ever need fabric scraps, you are most welcome to join the CLUB or check the CHEZVIES SHOP. 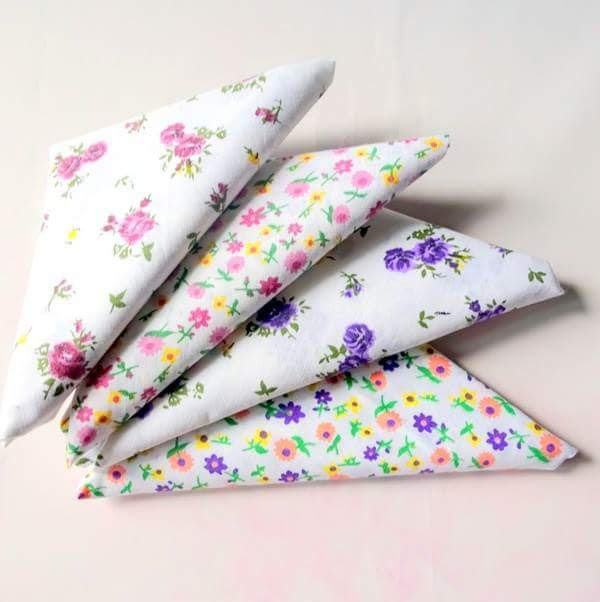 Never threw out even the smallest piece of your favorite fabrics! You can turn them into this pretty patchwork pouch. I was organizing my small scraps last Saturday and as a bonus, I decided to make this pouch. Actually I started out with card holder in mind. I even took out Suzuko Koseki book for guidance. I decided to do quilt as you go method since some of the scraps are quite tiny. And when the panel is ready, I was thinking, it will be better to make pouch! So here is the QAYG pouch with 2 different sides. One side is sober color and a bit brighter on the other side. I love zipper with binding, I made once and have not attempted again. So, this time I decided to do just that. Zipper with binding! and I love how it turned out. I added faux leather tassle too. It's uber cute!! Each piece of fabrics in this pouch has a memory of it's own. Some of them are from the leftover binding, some are from the corner cuts of a bag, etc. It is a special pouch! If you want to purchase the pouch, it's available HERE. I know I'll be making more, but there are so many other things I want to sew. My list keep growing. It's so good to be able to write the blog again. I've been writing in my mind all the time. I was so busy after I came back from summer holiday. I had a great time, by the way. I updated a few of the holiday photos in my Instagram account. So here's what happened. 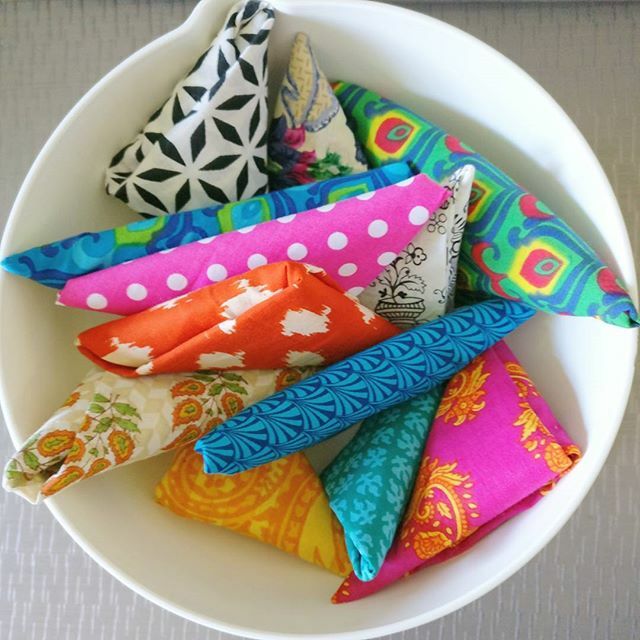 I made fabric bundles!! Yes, lots of them and I am still making more. This is part of my destashing program. I really enjoyed the process, cutting, putting the colors together, folding and taking good photos. Looking at these pretty fabrics, really lift up my spirit. 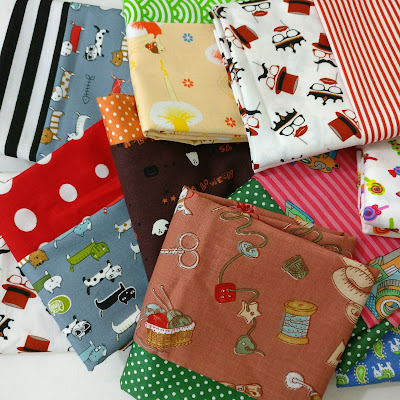 I still have a lot of bundles to make, if you're interested, you're most welcome to join Chezvies Fabrics Club on Facebook where you can get the first dip on the bundles. Make sure you check the shop to see what's available now.